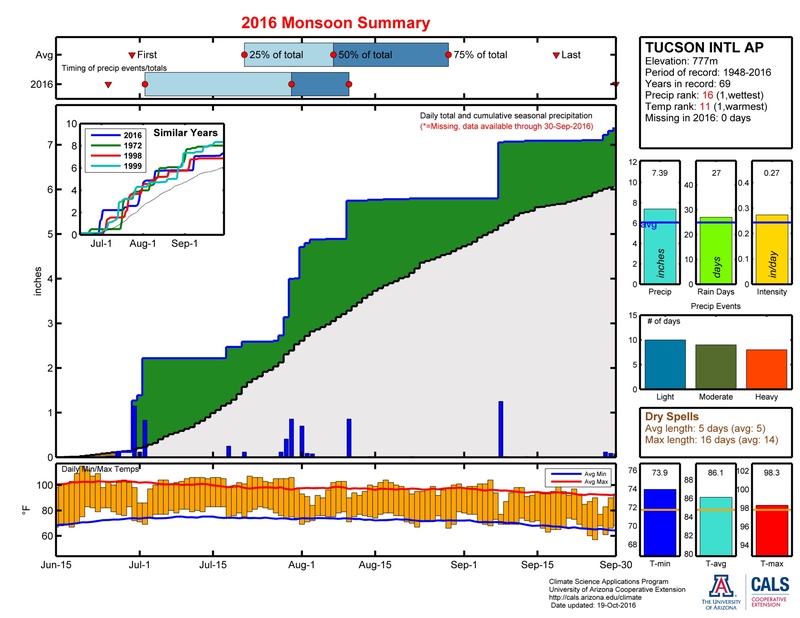 The Southwest saw the first strong burst of widespread monsoon activity near the end of June, followed by a break in monsoon activity over the first half of July as atmospheric circulation patterns and lack of available moisture limited opportunities for widespread storms to develop, especially at lower elevations. By mid-to-late July, increasingly favorable conditions helped storms to form and spread, culminating in an extended period of widespread activity during late July and early August. Tropical Storm Javier helped jumpstart activity again in mid-August, providing a brief extension to storm activity via a surge of moisture from the Gulf of California. 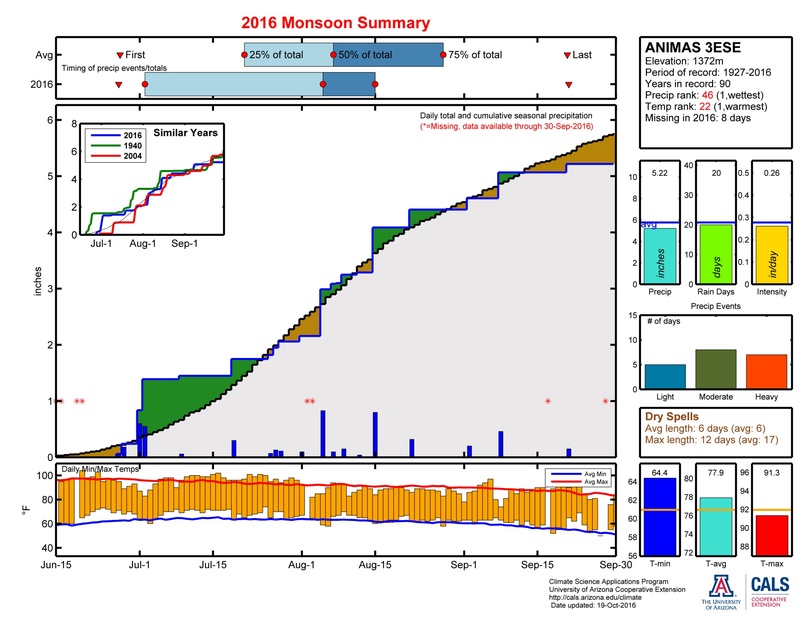 The remainder of August and September saw a decline in widespread monsoon activity, even while numerous areas did receive intermittent precipitation, particularly at higher elevations. 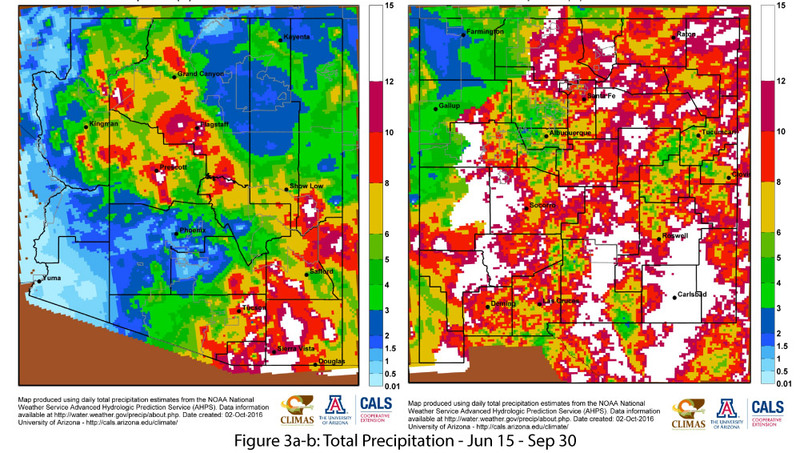 On September 7, Hurricane Newton generated significant precipitation in a swath across southwestern Arizona and into central New Mexico. Finally, portions of southeastern Arizona and southwestern New Mexico saw a run of storms linked to a cutoff low in late September. 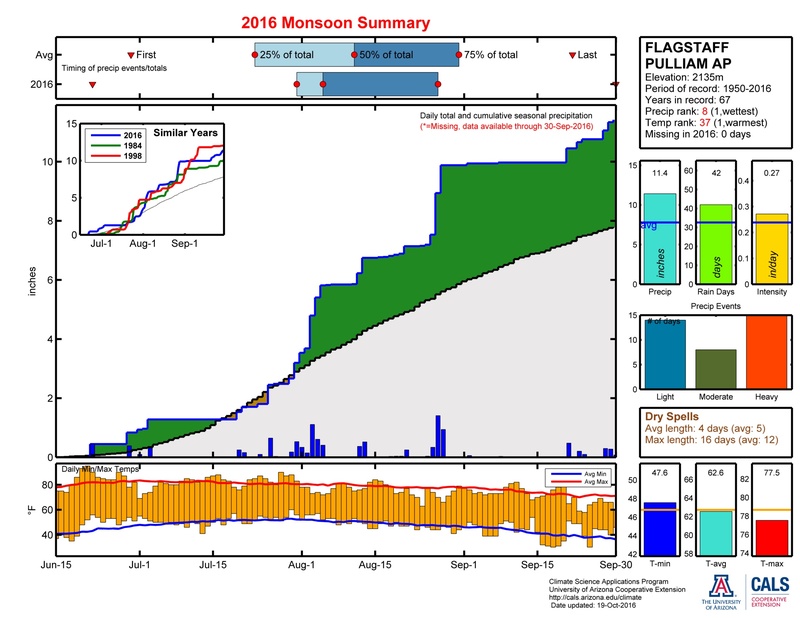 Based on cumulative totals for the official monsoon period, most of Arizona recorded average to below-average precipitation, even while clusters of the state recorded above-average rainfall (Figs. 2a and 3a). 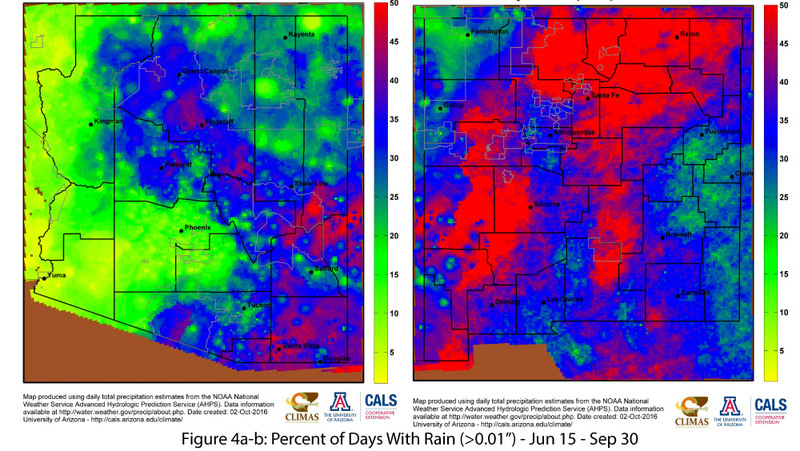 The percent of days with rain highlights the spatial variability of the monsoon and emphasizes the clustering of storms in the southeastern corner of the state (Fig. 4a). 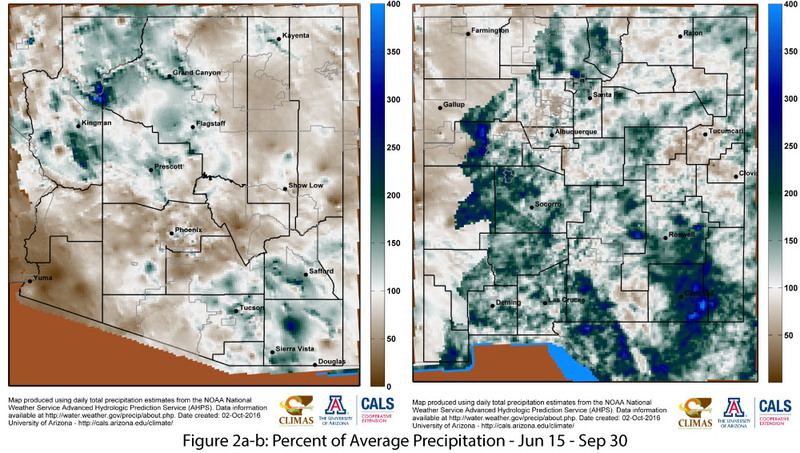 Precipitation plots from specific stations further highlight this variability, with Douglas, Flagstaff, and Tucson stations all showing that their seasonal average for monsoon precipitation had been surpassed by early September (Figs. 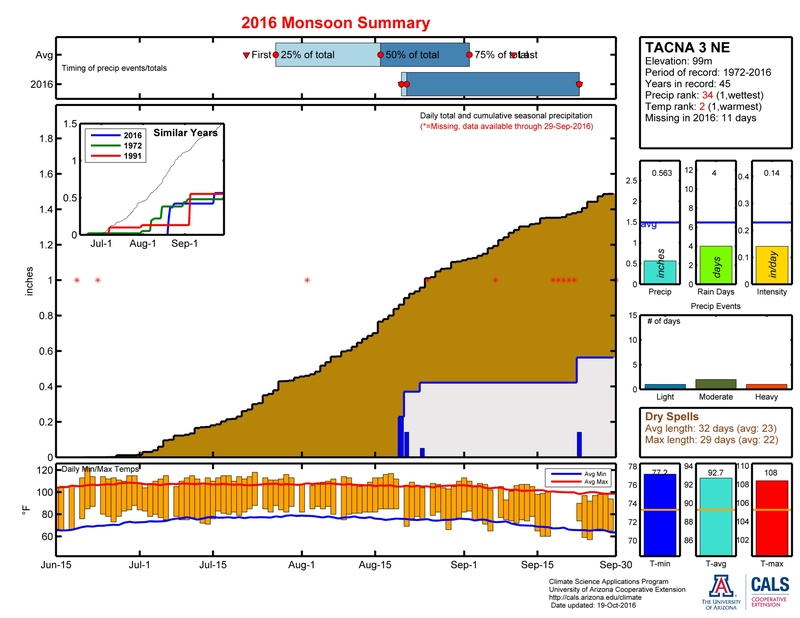 7a-c), while other stations such as Tacna 3 NE in the southwest corner of Arizona only recorded a few events and were well below their seasonal total (Fig. 7d). 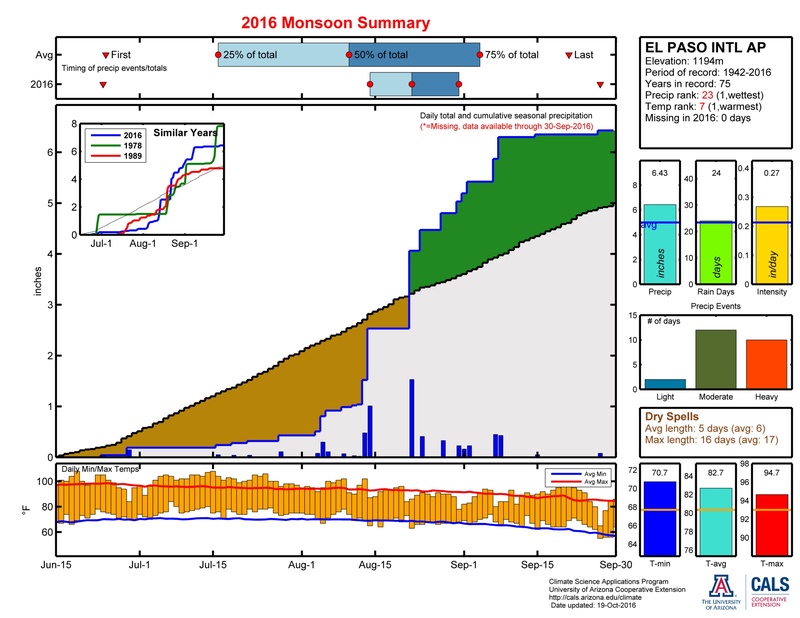 Cumulative monsoon precipitation totals show that New Mexico caught up in the last month. Much of the state recorded average to above-average monsoon total precipitation, although some areas remained below average (Figs. 2b and 3b). Relatively widespread, uniform precipitation was indicated by the observation that most of the stations across the state recorded rain on at least 30 percent of days in which rain was recorded anywhere, and a slightly smaller yet still significant region recorded rain on 50 percent of such days (Fig. 4b). 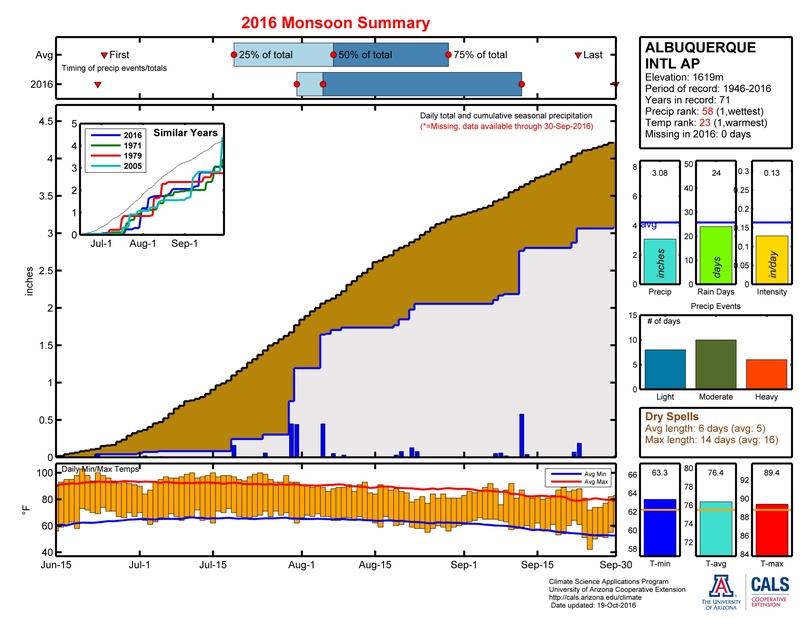 Station plots also demonstrate below-average precipitation in select locations such as Albuquerque and the Animas 3ESE station (Figs. 7e & 7g), while others such as El Paso, Texas, recorded above-average precipitation (Fig. 7f). The official monsoon lasts for 108 days (June 15 – Sept 30), but the majority of storm activity occurs in July and August (Figure 5 below). As the season progresses, conditions become increasingly less favorable for monsoon storm formation, shifting from a typical monsoon circulation (e.g. Four Corners high) to a more fall-like pattern (Figs. 6a-6b). 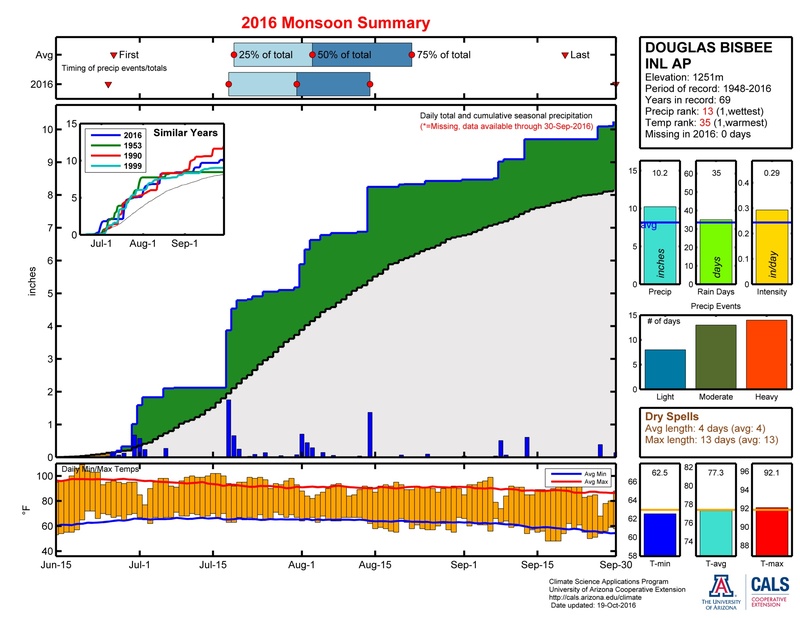 In 2016 there was a general consensus that the monsoon had basically shut down by mid-August. Around this time, however, eastern Pacific tropical storm activity ramped up (e.g. Javier, Newton), as typically occurs. Such activity is frequently attributed to the monsoon, as it contributes additional moisture to the region and can help fuel monsoon storm activity. Furthermore, the shifting circulation patterns can help recurve tropical storm activity back into the Southwest. The tropical storm season extends well beyond the bounds of the official monsoon, so it is a matter of timing and/or chance whether these storms contribute moisture before or after the September 30 monsoon cutoff. A few key events – Javier in August, Newton in early September, a cutoff low in late September – helped produce precipitation through the end of September. These storms may not be directly tied to the monsoon circulation patterns we see at the peak of the monsoon in July and August, but they do “count” in terms of seasonal totals and scoring the monsoon.